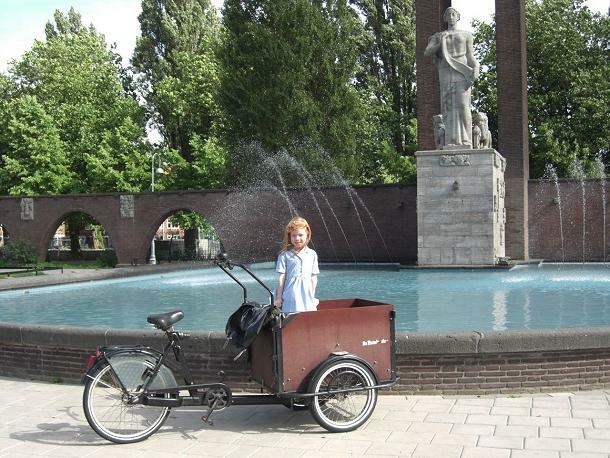 Whilst living in Amsterdam from 2005 to 2009, we didn’t have a car but a Bakfiets, a rough translation from Dutch is “box bike”. These come in several different forms, some 2-wheelers, some (like ours) a very heavy tricycle with two wheels at the front with a hefty wooden box across the axle. Inside the box we had two small bench seats (which could slide out if more storage space was needed) so you could fit up to 4 small children. In bad weather there was a large see-through water proof cover attached onto hoops. This really was as good as a small car, and was used to transport all manner of stuff, from a whole weeks shopping, to pot plants and on one occasion, a large stone Buddha! One of it’s greatest advantages was that it was perfectly legal to ride and park these on the pavement – a bit of a coup in a city! A disadvantage was it’s ‘nickability’ due to the fact that you needed a carry around a chain which would not have looked out of place on the QE2, and then try to find something to chain it to which could only be removed by the use of a digger… But on the up side, it was very good for the thigh muscles! 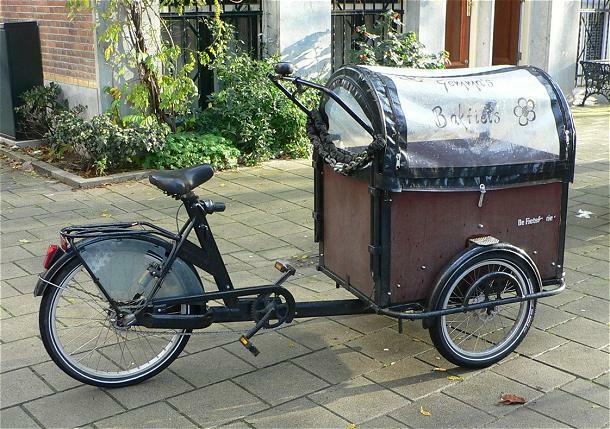 If you go to WWW.Bakfiets.NL you will see the different types available. New, with all accessories, you wouldn’t get much change from €3000 but a good used one could be picked up for about €1500 and they really held their price. My daughter, Gemma, used to go to school in hers, ably driven by Rosie. Above is a picture of Gemma on the way back from school. 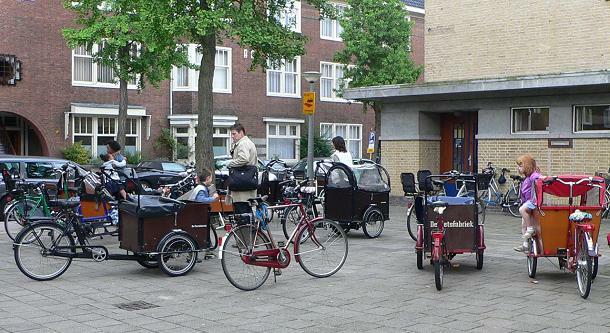 As you can see at the school drop off, a car park at a Dutch school was a completely different thing, and brought a new dimension to ‘road rage’. The route to school took Rosie past the Amsterdam Hilton, and there must be myriad photos across the United States and Japan, taken by awestruck tourists. 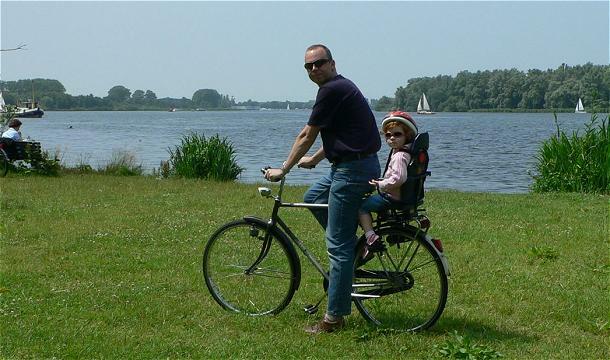 If we needed a bit more agility or pace when Gemma was small she used to travel on the back of my Dutch street bike. If anyone wants to chat about my previous cycling in Holland, which is very different to the club rides, ask me on one of the rides.